Hi everyone. 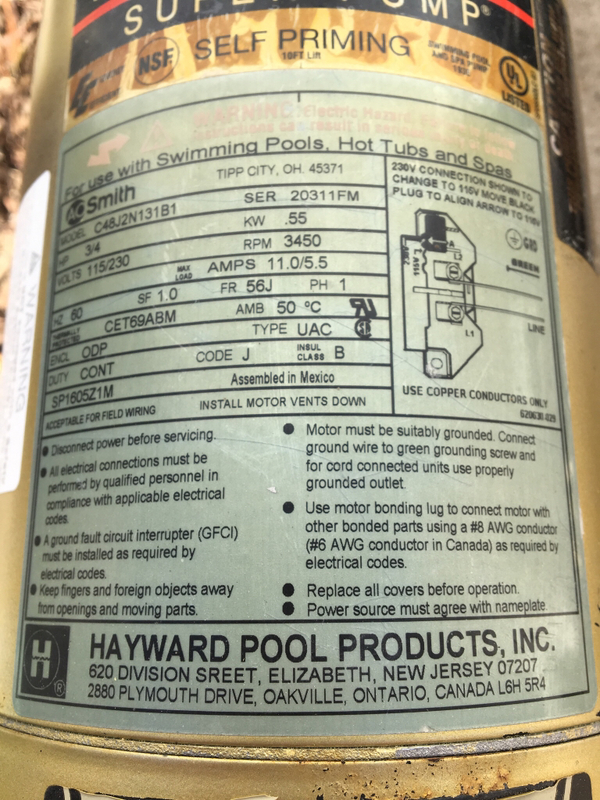 I need to replace the breaker for my pool pump but all of the info on the breaker has been rubbed off. Here is a picture of the nameplate on the motor. Thanks for the help! Either a 15 amp of 20 amp GFCI would work. Does it need to be double pole? Check the current setup per the diagram on the upper right of the label. See which position the black arrow is in. If it is 120V then you can use a single. Is the pump on a dedicated circuit? What he said. 120V is single pole and 240V is double pole. Hopefully it's already on it own circuit. Just make sure the new breaker is GFCI per latest codes and for safety. I currently have my main pump and booster on one 20A breaker, 240V with no issues. I ordered the breaker from Home Depot as they had the best price. Then you need a double pole 20 or 15 amp GFCI breaker.